Rani's Yummy Shooters in Cinnamon Sensation- These are 100% natural oats with cinnamon, butter, brown sugar and maple syrup. And yes, they're tasty! Kosmatology Foaming Hand Soap in Goody Goody Grapefruit- So I love foaming hand soap. I have the Honest Co. soap all over my house but this Kosmatology scent is delicious so I replaced the upstairs bathroom soap with this one. It's made with natural and organic ingredients. Old Orchard No. 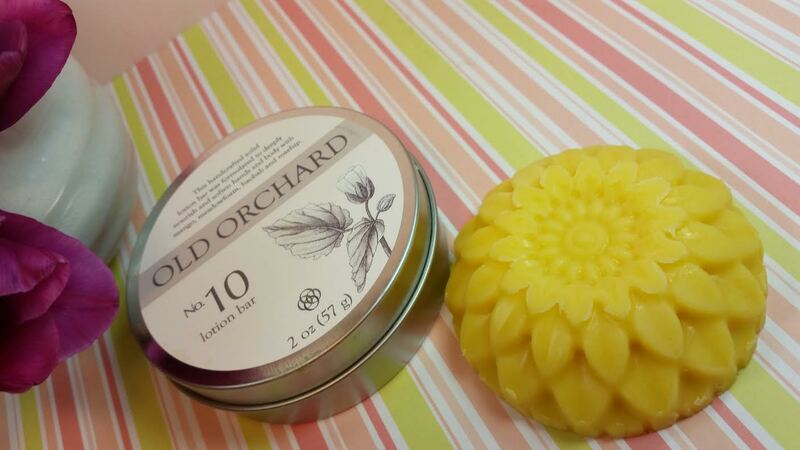 10 Lotion Bar- This is made with baobab and rosehip oils with mango and shea butter. It smells so good. It's a light citrus and uses natural and organic oils. It's so pretty I don't want to use it but my hands are so soft after handling it that I think the pretty flower is going to disappear pretty quickly. I am a little hooked on it. Bridge Nine Candle Co in Citrus- The theme for this month is Spring but it's also citrus, apparently. I love citrus scents and this smells wonderful. This is handpoured and made with soy wax and cotton wicks. It has a 20 hour burn time. 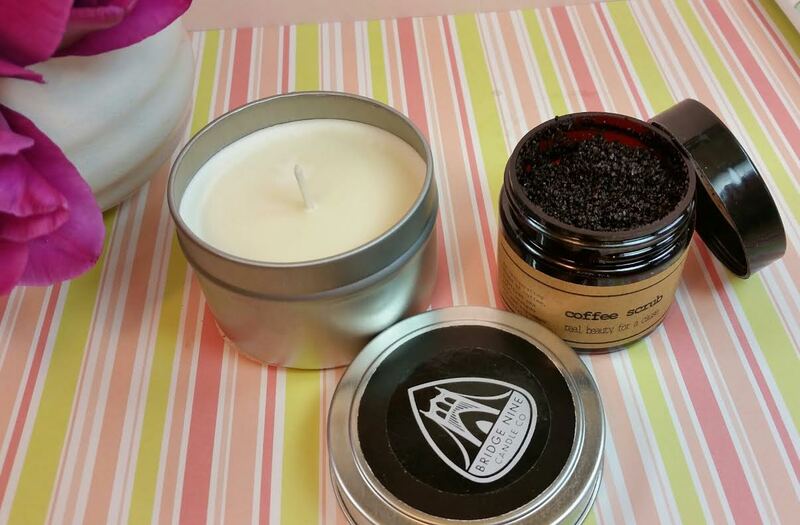 Real Beauty for a Cause Coffee Scrub- It's all citrus till you get to the coffee! This makes my mouth water with it's coffee goodness. It's made with coffee, himalayan sea salt, avocado oil and cinnamon essential oil. It's basically dry (I'm guessing its supposed to be like that?) so I'd probably add it to something in order to get it to stick together enough to scrub. Cinnamon oil is not really recommended for use on your face because (depending on the type) it can be irritating. This doesn't say what type of cinnamon oil is used but I think the amount is probably negligible. Real Beauty donates 25% of their profits to different charities each month. How cool is that? VERDICT: Kloverbox once again does a great job with curation, finding useful and interesting items for this April box. I really like how not everything is beauty related. I get a lot of beauty boxes but with Kloverbox I feel like I get a lot more than just natural skincare. 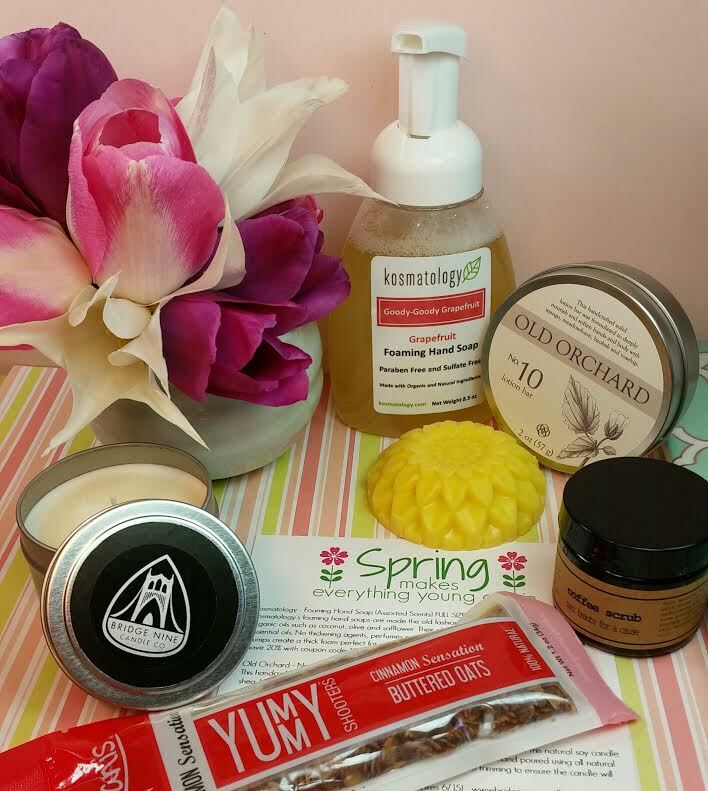 I get eco-friendly, natural and organic goodies for my skin, my tastebuds and my home! Plus there's always so many full sizes! Love! This box also included a Urban Oreganics Makeup Brush Cleaner in solid form as a replacement for last months toner issue. It turned out that Urban Oreganics had acquired bottles from a new supplier that weren't up to standard. Needless to say, the owner is no longer using them for her supplies! Poor thing. Kloverbox was so awesome about it all, too. So transparent about the whole issue and then working with Urban Oreganics to make it good. If you would like to sign up for Kloverbox, you can do that here. It's probably the best, most affordable box of it's kind. Use code BAB10 to get 10% off your subscription! This really is a great way to get your hands on new organic and natural products and I think you'll enjoy it! *This box was sent to me for review purposes. All opinions are mine and no one elses. If you did get the March box but not the brush cleaner in your April box, you might want to check on it. The brush cleaner is a really nice, large sized product. Haha! Yep, it was there but I didn't want to get new subscribers hopes up so I didn't include it in the photos. It's actually sitting in the place of honor on my counter. I'm using it to wash my brushes tomorrow (it's an undertaking, I have a lot of brushes....).